Pictured the son of recently deceased, Springfield, Minnesota woman, Kathleen Dehmlow-Jay Dehmalo. 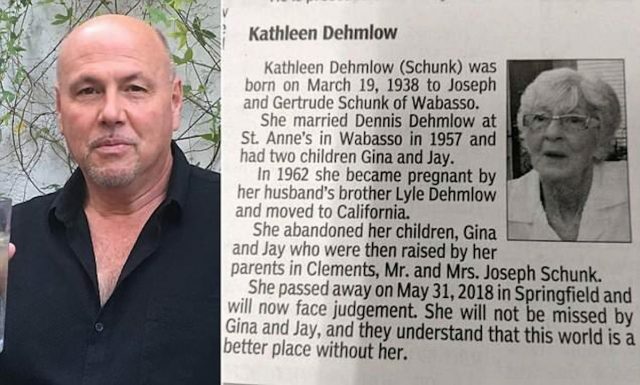 Kathleen Dehmlow Springfield obituary: The children of Dehmlow, Jay Dehmalo and his sister, Gina explain their need to have closure and wanting to get the ‘last word in’ following years of torment and family dissent. The children of a Springfield, Minnesota woman who died last wek and who then posted a scathing obituary of their mother in local press have revealed what inspired them. The tell all follows recently deceased 80 year old, Kathleen Dehmlow, passing away on Thursday and her 58 year old son, Jay Dehmalo and the mother’s ‘abandoned’ daughter, Gina, 60, wishing to ‘get the last word out’. 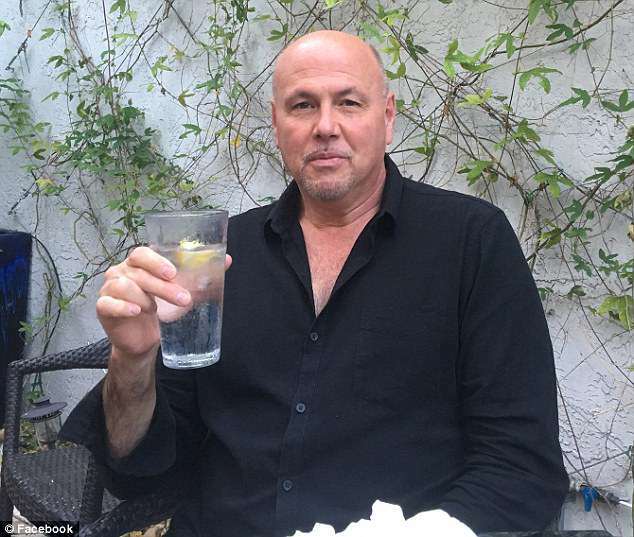 In an exclusive via the dailymail, Dehmalo and his sister, told of seeking to express the abandonment, abuse and heartache that lay behind brother and sister’s decision to get up close and personal. Too personal as it seemed for some- given the scathing comments on social media- which were equally balanced by those who congratulate the children, for ‘telling it the way it was’. The brother and sister’s obituary appeared last Thursday in the Redwood Falls Gazette last week, with the siblings candidly describing how the Minnesota woman ‘abandoned her children’ to be raised by their grandparents when she became pregnant by her husband’s brother. In the exclusive, Jay Dehmalo, a retired army veteran and former professional boxer explained why he and his older sister, Gina, had felt moved to publish such an obituary. According to Dehmalo, it was Gina’s idea to write the obituary upon learning from a cousin that her mother was on her deathbed. And the mystery behind Kathleen Dehmlow’s obituary takes another turn. But according to Dehmalo – who changed his last name to distance himself from his past and his family – his mother’s abandonment was so complete that childhood friends have reached out to him on reading the obituary shocked to discover his mother wasn’t already dead. Dehmalo, a father of one, admitted he and his sister having ‘reservations’ about going through with the obituary – conscious that it could stir up the ill feeling that has clearly stalked this family through the decades. And stirred up discontent the obituary did, with Kathleen’s surviving sister, Judy, saying her nephew’s obituary was ‘nasty’ and had ‘hurt the family tremendously’. That’s not the way Dehmalo and his sister, who now lives in Florida, saw matters, stressing that it ‘was very important that some portion of the truth should emerge,’ after being hidden for years. Pictured, Jay Dehmalo the son of Kathleen Dehmlow. Following their mother falling pregnant to her husband’s brother, the children’s maternal grandparents, Gertrude and Joseph Schunk took their daughter’s children in. From there the siblings were forced to contend with family members travails with alcohol along with Dehmalo admitting that he and his sister were ‘bad kids’ at times with his sister’s troubles following her into adulthood as she has twice been convicted of domestic violence and battery. According to Dehmalo, rivalries and ill feeling were only heightened after he and his sister inherited only ‘a couple of thousand dollars’ on their grandparents’ deaths. They did not know that they had two half-brothers out of Kathleen’s union with their uncle until several years after the boys’ births. Dehmalo said that while he and his sister were unhappily abandoned in Minnesota their mother was, ‘off having a great life in California with her other kids’. Dehmalo credits the Army and boxing with ‘saving him’. Gina is now married and living in Florida where she works as a cleaner. Asked if they would still post the obituary despite the public fallout, the siblings said they would do it all over again. A claim that might be true for the time being but perhaps a pointless task in the years to come as both Dehmalo and his sister are forced to put to pasture what they endured or allow old wounds to fester…. Minnesota family ‘good riddance’ obituary to mother who abandoned them goes viral.